Mar Baselius, one of the towering giants of ancient Christianity, was an Asian by birth. He is one of the Cappodocian fathers. Cappodocia was a province of Asia (present – day Turkey). His parents lived in Caesarea, the capital of the province. It was a remarkable family. Mar Baselius’ father the elder Basil, had five sons and five daughters. Three of the sons became bishops – Mar Baselius in Caesaria, Mar Gregorios in Nyssa and Mar Pethros in Sebaste. The eldest sister of Mar Baselius, Martha Makarina, deserves a chapter to herself, for she was both a saint and a scholar, the founder of monastic communities for women, and the teacher of her brothers who became bishops. Even as a bishop, says Mar Gregorios, he learned from his sister the great mysteries of the faith. Mar Baselius was educated in the best pagan schools of his time, and was thus one of the most educated of his contemporaries. He studied first from his father and grandmother, who were themselves both great scholars. He then studied in his native Caesarea, then moved to Constantinople, and finally to Athens, the centre of all learning at that time. After all his studies, which he completed with the greatest honours, he returned to his native Caesarea, proud as a peacock as his own brother says. He began his career as a rhetorician (secular professor) in his own native Caesarea, but as Mar Baselius himself says in his letter (no. 223). He was soon baptized, after having been duly instructed by his sister Makarina. He then travelled in Egypt, Syria, Palestine and Mesopotamia to learn from the many monks who lived in these parts. When he returned, he distributed his wealth among the poor (he was a very rich man) and went in to solitude for prayer and fasting. Soon others joined him, including his friend and classmate Mar Gregorios of Nazianzus, though only temporarily. The community grew and it became a great spiritual centre of Christianity in Asia. Mar Baselius wrote, in co-operation with Mar Gregorios Nazianzen, the rules for a monastic community. These rules are the basis for all eastern monasticism, and for some forms of western monasticism like that of the Benedictines. In a short time he founded other monasteries, and his sister Makarina started a convent for women across the river from the men’s monastery. Together they established hospitals for the sick, nursing homes for lepers, homes for the poor, hotels for travellers and strangers; and the monasteries soon became a spiritual city, where the poor and the destitute praised God for His wonderful ways. 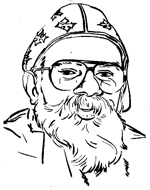 In addition to his great learning and spirituality, St. 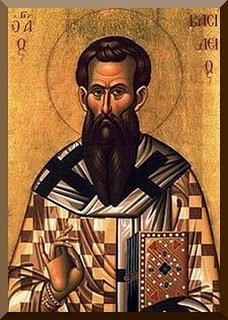 Basil was, like Mar Athanasius, a man of very great personal courage. He stood up to the Emperor Valens when pressured to support the Arian heresy. When the Emperor sent his Viceroy to threaten Mar Baselius with confiscation of goods, torture and exile, Basil replied that he had nothing to be confiscated except a cloak and a few books, and as for exile, anywhere in the world would be his home. As for torture, he said his body would give up its life at the first blow, and that Modestus the Viceroy would be doing him a favour by sending him off to God so quickly. (a) Against Arius and his disciples he established the full deity of Christ. He thus completed the work of Mar Athanasius. (b) He established clearly the deity of the Holy Spirit. (c) Thus he established a full doctrine of Holy Trinity as three hypostases in one ousia. He was also a great monk who laid down the basic principles of community monasticism – a balance between prayer, study and work and the need to serve one’s fellowmen by working with one’s own hands. He was a great man, very learned very aristocratic, who lived in simplicity and poverty. His humility was not on the surface. He was regarded as a proud man, but his heart was truly humble. Mar Baselius died on Jan 1, 379, about six years after Mar Athanasius had died.